Collected here are links to Sony α Alpha DSLR-A700 reviews, samples and other resources. Could this be the perfect camera for Konica Minolta Maxxum (Dynax) 7D digital SLR camera owners who wish to upgrade? Richard Bird’s Test: Richard shares full-sized samples and his thoughts in this Sony A700 vs Konica-Minolta 5D high-ISO test. Solid feel. When the vertical battery grip (which is made of magnesium) is attached, the A700 feels larger (but lighter) than the Canon EOS 20D / 30D cameras with the same. The shutter release button is brilliantly designed in such a way that it is almost in line with the lens (to my knowledge, no other battery grip from any other manufacturer is designed this way). The information screen automatically switches to portrait mode when the camera is rotated to a vertical orientation. The A700 is currently the only digital SLR camera on the market able to shoot photos in 16:9 aspect ratio. Initial retail price for the A700 in Canada is expected to be $1599 CDN body only, $2050 CDN body with the new DT 16 — 105 mm kit lens (equivalent to 24-158mm in 35mm terms). Initial impressions of ISO 6400 images were very positive — the photos look to be actually usable for smaller-sized prints. Release dates in Canada are: body only — September 2007, body plus kit lens — mid-November 2007. Important: The A700 is sealed against dust and moisture, but is NOT water-, or even splash-proof. AF (auto focus) feels faster than on the Canon 20D. Viewfinder feels big and bright. Information and images on the rear LCD were easily viewable even in bright, mid-day sun. Doug comments further about the tremendous quality of the HDMI output to a high-definition TV, and his opinion about framing in 16:9. The shutter is very quiet and discreet, and is definitely better than on Doug’s Canon 20D and Olympus E-510. You can hear the A700’s shutter at 7:13 of this video. ISO performance on the A700 is on par with the Canon 20D up to ISO 1600. Remarkably, noise at ISO 6400 is virtually indistinguishable from the noise at ISO 3200. Doug shares this photo showing the innards of the A700. This section will be continuously updated as more A700 sample images come online, but in the meantime, read PopPhoto’s account of how the A700 was put through its paces at an event where the A700 was introduced to journalists. The idea of using a stunt attack biplane and somersaulting stunt water bike riders to showcase the A700’s awesome 5 fps (frames-per-second), continuous AF and buffer depth is simply brilliant marketing. Sony Alpha 700 First Impressions — This nice article was put up at e-fotografija.si (a Slovenian site) not long after the A700 was announced. Bear in mind that all photos are taken with a pre-production unit, so you’d probably get better images from a production-level model. On page 2, you get to see a high-quality pictures of the rear LCD with beautiful fonts and colors used to render its menus. Sample photos begin on page 3. The first image shows very good exposure metering from the A700 of a high-contrast scene. You also get six web-sized images shot with the $6000 Sony SAL-300F28G — 300mm f/2.8 G-Series Super Telephoto lens, with 100% crops from three of them. It has to be said that you get really superb bokeh from that lens. On page 4, two more photos with the 300mm lens and 100% crops are shown. Additionally, there are three images (with 100% crops) shot with a Sony SAL-1680Z — Carl Zeiss Vario-Sonnar T* DT 16-80mm f/3.5-4.5 Zoom Lens, and more interestingly, two high-ISO JPG sample images (plus 100% crops), one at ISO 3200, and the other at ISO 6400 — these are great for making judgment about how the image processor in the A700 handles noise reduction. Download full-sized A700 samples from DPNow.com — The folks of DPNow were also at the same launch as e-Fotografija, and has shared 5 A700 samples for your viewing pleasure. Lenses used were the Sony 300mm f/2.8 and Carl Zeiss 16-80mm. This A700 portrait (sans face) is especially good — look at the detail in his hand. The very first, official A700 sample photos — Go download three extremely classy portraits shot at ISO 100 with the following lenses: 135mm F2.8 [T4.5] STF (Smooth Transition Focus for out-of-this-world bokeh, a manually-focused lens, lens specs at Dyxum, official page at SonyStyle, lens history at Wikipedia), 70-200mm F2.8G and Vario-Sonnar T*DT16-80mm F3.5-4.5 ZA. I like the second one. Sony A700 samples at Fotopolis.pl — Five full-sized A700 samples are provided, and the ISO is tested from ISO 100 (outdoors) to ISO 6400 (indoors, incandescent lighting). These are among the very first photos taken with the A700 to circulate on the internet. ISO Test Series at Cameralabs.com — No full images here, just 100% crops off a Gretag chart pitting the A700 vs. A100, Canon 5D and Nikon D80 at all applicable ISO values. Cameralabs also has two sets (one shot with the Sony SAL-1870 — 18-70mm f/3.5-5.6 DT zoom lens — DT means that this lens is suitable only for cameras with APS-C sensors, and the other with the Sony SAL-50F14 — 50mm f/1.4) of 100% crops of the same scene shot with the Alpha 100 vs Alpha 700. A700 ISO 3200 image at SonyUSerForum.de — Embedded in that forum post are one resized photo, and a 100% crop. As usual, DPreview’s version is the most comprehensive one out there. 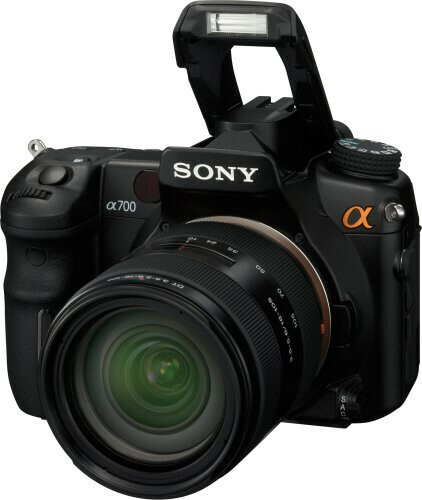 Read the Sony A700 Press Release. Sensor: 12.24 Megapixels, Exmor CMOS (which features on-chip, rather than separate, A/D conversion). Perhaps it’s a slightly different sensor to the one in the Nikon D300? ISO range: ISO 100 to ISO 3200, with ISO 6400 available in expanded mode, Automatic ISO is available in the 200 — 1600 range, with configurable upper and lower limits. In-body image stabilization using Sony’s sensor-based Super Steady Shot (SSS) technology. A highly-accurate AF system incorporating an AF motor that’s as fast as the film SLR Maxxum 7, reputed to be the world’s fastest AF motor. More specs, pictures and discussion in Vibrio’s A700 post. Full A700 specs at DPReview.com. Henry Richardson’s summary of the A700 specs that matter to him (AF (auto focus), SSS and high ISO noise improvements, size and weight, etc) — great read! It would have been nice if the A700 had incorporated a microwave oven. The best-featured battery grip (VG-C70AM) on the market — see a picture of it, and DPReview’s related comment on the vertical grip at the bottom of the page. Refer to Imaging Resource for A700 timings and performance — for instance, Prefocused Shutter Response (Lag Time) is recorded there as 0.073 second. Overall, the A700 is reported to be much faster than the A100 in every area of performance. Cameralabs has a very comprehensive video review of the A700. I really liked their presentation of the LCD menus. Those more curious about the superb battery grip should fast forward to 1:11 — you can clearly see the ingenuity in positioning the shutter release button to be in line with the top of the lens mount. This page has a side-by-side photo of the A700 vs A100 (front and top view). Someone said that this mirrored flash video presentation of the A700 is a bit scary — I agree! Maybe it’s the music or something, but I got the impression that, like The Terminator, the new Alpha and all its lenses are going to take over Mankind. You’ll find some screen shots of A100 vs A700 spec comparison tables below that video. If you get a memory buffer error message, follow this tip by B Shaw. Thanks to Lucas for providing this Photoshopped comparison image, placing the Sony A700, Canon EOS 40D and Nikon D300 side-by-side, showing front, rear and top views. To this day, I still can’t figure out how they do this … anyone? Note that the A700 is the only camera without a top control panel LCD. Dynamic Range Optimizer — Gipper51 likes the fact that the A700 now offers 5 levels of adjustments, vs. the version on the Alpha A100 which only had On or Off. LiveView — The A700 won’t come with a Live View feature. I think that’s a little disappointing, as LiveView’s useful for those who want to shoot with the camera tethered to a computer (best example of this is a video of the shooting the Canon 1D Mark III remotely, scroll all the way down Vincent Laforet’s article, and click the link that says http://vincentlaforet.com/f.mov — Warning! It’s a huge video file.). Anyway, here’s a LiveView poll for your perusal. In that poll, Auksnapper comments that he will use LiveView when the camera is mounted on a tripod for macro, still life and landscape work. Viewfinder (VF) magnification and coverage — Interested in how the A700’s VF compares to the rest? Smaller than the Nikon D300, but bigger than the Canon 40D. VF comparisons for 7 cameras: Canon 400D / Rebel XTi, Canon 40D, Nikon D200, Nikon D300, Pentax K10D, Sony A100, Sony A700. More detailed VF specs: Sony A700 vs Alpha A100. All Sony products – Main page.